Lark and Wren Noble are twins. They’re nearly identical except that Lark is platinum blonde and Wren is a redhead . . . and a ghost. Lark has just returned to school after a stay in a mental institution following a suicide attempt. The other students thought she was crazy for talking for her dead sister before that ordeal and she’s even more conscious of their scrutiny now. So when a group that includes the boy who saved her life reaches out and tries to befriend her, she doesn’t trust them even though they believe her. The bond between the twins and their relationship with the spirit world, however, was something I haven’t seen before. The girls are stronger when they work together and can do things that neither should be able to do but they don’t know the extent of their powers and have been learning as they go. By the end of the book though, they’re starting to research the history and mythology of twins like them and I’m really curious about how that will develop. I also liked the relationships and potential love triangles developing between Lark and her would-be Scooby gang. That part of this book will definitely appeal to Buffy fans. (Lark even busts out some fighting moves!) I’d be happy to see this group get into more trouble together, which would also give Lark and Wren the opportunity to explore their powers some more. This is my first Kady Cross book, though I’m a big fan of her alter ego Kate Locke’s adult series Immortal Empire. 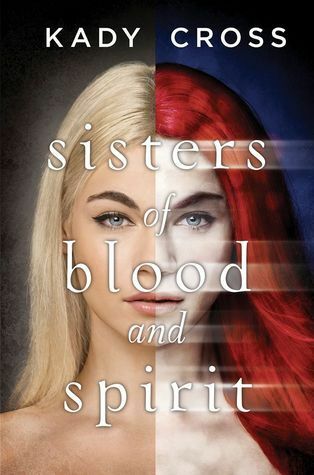 I think I’ll definitely have to give some more of her YA a try while I wait for the sequel to Sisters of Blood and Spirit. This was my first Kady Cross book too, and I really liked it. I loved the relationship between Wren and Lark. And I didn’t mind the potential love triangle either (usually that’s not my sort of thing). Thanks! I think it’s because there’s more than one triangle that it becomes interesting instead of feeling cliche.